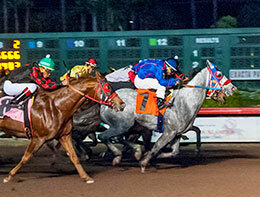 Rite Quick (#7) gets up under jockey Alberto Zepeda to win the $18,000 Blink Of An Eye Handicap at Los Alamitos Race Course. CYPRESS, CA—FEBRUARY 2, 2019—Rite Quick got up at the wire to defeat Kiss N Air by a head Friday night at Los Alamitos, winning his fourth consecutive race and first career stakes win in the $18,000 Blink Of An Eye Handicap. The 4-year-old son of multiple grade 1 sire Favorite Cartel broke in under jockey Alberto Zepeda but still completed the 100 yard dash in a final clocking of :6.536 seconds, into a 4 mph headwind. Conditioned by trainer Yanet Rodriguez, the Alberto Rosiles owned runner kicked off his current four-race win streak when he broke his maiden last November. The gray picked off two consecutive allowance wins at Los Alamitos before stepping up in class to win the Blink Of An Eye. Steve D Burns, DVM bred Rite Quick in California from the Chicks Beduino mare Iba Quick Chick. He has compiled a (13) 4-2-0 record and the $9,900 Blink Of An Eye winners' purse boosted his career mark to $30,870. The gelding was well regarded by his connections during his freshman and sophomore campaigns, as he participated in the trials to the Grade 1 Los Alamitos Two Million Futurity and in last year’s trials to the Grade 1 Los Alamitos Super Derby. It now appears that he has found a niche with the class relief and will be one to watch in the months to come. Kiss An Air, a California-bred daughter of Dashair, earned $4.050 for finishing second. Ridden by jockey Eddie Garcia the Jesus Nunez trainee broke well but could not hold off the winner. Koleen Ledgerwood races the John Andreini bred from the Tres Seis mare Kiss N Toll. She has banked $43,390. Cuadra Mariscal's multiple stakes winner Snowy Coronitas finished a neck back in the blanket finish to pick up $2,250 for third. Salvador Naranjo trains the Count Corona 7-year-old out of Snow Memory by This Snow Is Royal. Bred by Luis Mariscal, Snowy Coronitas has earned over $56,500. Jairo Rangel had the riding call. Jodee B Valiant, The Cartel Hawk, Seems Even Better, La Sierran and Indi Anna completed the field.